Shishkin depicts the true magnificence of native nature. The main hero of the canvas becomes a forest. He strikes with his mighty trees. They ate straight into the sky. They grow very close to one another. If you try to penetrate the gaze into the thick of this mysterious forest, it seems that there is complete darkness. It is no coincidence that it seems to us that it is there that something very scary and mysterious is hidden. But this is only an illusion. The forest is completely harmless. These associations are inspired by dark needles and dark shades of trunks. The whole space is shrouded in a fir forest. He prefers to protect his possessions, not letting anyone in them. On the ground, you can see only the lichen gray shade and moss green. This is a kind of cobweb, which miraculously enveloped not only the whole earth, but also the trunks of the majestic fir trees. Huge trees do not give way to the light of the shoots, which sometimes appears here. She seeks to somehow survive in this old virgin forest. Small trees look sickly and very inconspicuous. The forest seems dark, but you can see among the tops of the blue sky, which is illuminated by the warm rays of the sun. The small glade which Shishkin depicted in the foreground is also illuminated by him. 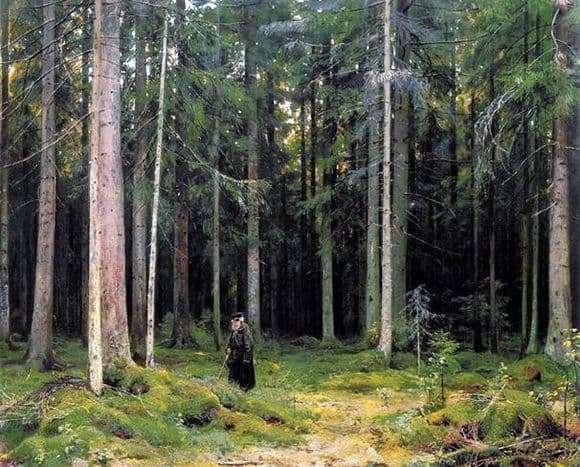 The artist depicts a man in the forest. This suggests that they did not eat as densely as it first seemed to us. This is an older man with a beard. He probably works as a forester. We see that he is thinking about something, leaning on a cane. It is likely that he is attracted by a walk in the silence of this forest. He listens to the sounds of the most mysterious nature. The air here is very fresh and clean. In the spruce forest you can think and distract from ordinary life. The viewer is fully immersed in the atmosphere of this spruce forest and begins to feel even the scent of pine needles. An irresistible desire arises as well as the forester in this picture, stop and think about something important.